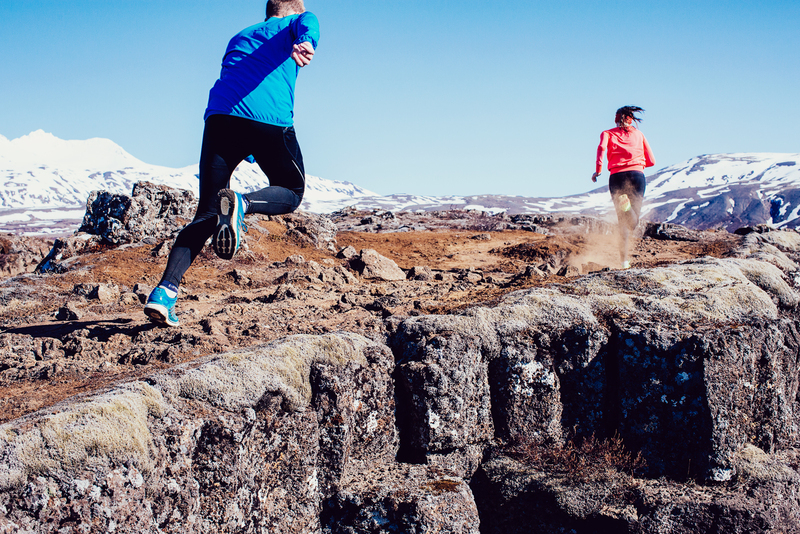 The popularity of trail running in Iceland is growing every year and there are now excellent trail racing options in all parts of the country during the summer. This is a trail run in the wilderness next to Hafnarfjörður. The race starts from the sport center Ásvellir in Hafnarfjördur, conveniently only 20 km from Reykjavik city center. It’s a very nice and well run event with exceptionally cheerful staff. The Peaks Run takes place in and around Mosfellsbær which is 15 minutes’ drive from Reykjavik city center. This is a challenging run, especially if you go for the 7 summits! Most of the peaks are around 300m height, although the highest peak is close to 500m high. Check out a map of the course. The Mt. Esja Ultra is one of few pure mountain races held in the country and is considered the toughest single stage race in Iceland. The Esja mountain range is very popular for outdoors activity and is located just 25 minutes away from Reykjavik city by car. For further information see the Mt. Esja Ultra homepage. The Álafosshlaup is held in Mosfellsbær, ca. 15 km from Reykjavik city center. The race is set in a very charming area. It is not really a trail race as large parts of it are on asphalt but the first half is on trails. This is a small and cozy race that is a lot of fun. Here you can see a map of the course. Eco Trail Reykjavik is a newcomer on the marathon and trail running scene, it was first held in July 2017. The race starts late in the evening at 10 pm but those running through the night are fortunate enough to do so when the summer nights here are at their brightest. There is a different starting point for each distance, but they all start on the Reykjanes peninsula, famous for its geothermal activity. All the races finish by the geothermal beach Nautholsvik in Reykjavik where you relax in the hot tub and even speed up your recovery by taking a dip into the cold ocean. The Laugavegur Ultra is the undisputed king of Icelandic trail races. It’s the biggest and best known trail and ultra race in the country and draws many participants every year from abroad. The trail is located in the southern highlands of Iceland and connects the nature reserves Landmannalaugar and Thorsmork. It’s a challenging race, but the stunning beauty of the trail makes it an unforgettable one as well. The Hengill Ultra is the longest trail run in Iceland. The race takes the participants through open ranges and mountain rifts in the Hengill area. Parts of the course are on paths well maintained by the local geothermal company, others parts differ in style with narrow and steep paths leading up to the highest point, the mountain Skeggi (810 m) the highest point. Hveragerði is a small town located approx. 40 minutes drive from Reykjavík. The Volcano Trail Run is a 12 km long trail run through the Þórsmörk Nature Reserve. The route of the race leads from Húsadalur in Þórsmörk through some of the most beautiful landscape in Iceland. The trail goes through birch woods up onto the volcanic ridges and mountain tops over the Þórsmörk before reaching the finish line, back at Husadalur. The highest point of the route is the fell Valahnúkur which is 275m high. Þórsmörk is 150km from Reykjavik. Snæfellsjökulshlaupið is a 22 km trail run across Snæfellsnes peninsula. The race starts at the idyllic village Arnarstapi and ends in Olafsvik. The course mainly follows an old gravel road next to the mystical Snæfellsjökull glacier, also an active volcano. The first 9km or so are uphill, until you are up to around 700m height. The road has different variations of steepness, so in between steep hills runners get short (very short!) breaks from the climb. Conditions of the route vary from year to year, for example one year runners had to run in deep snow for 5 km. The glacier Snæfellsjökull dominates the landscape and the area is one of Iceland’s most popular tourist attractions. Arnarstapi is located 190 km from Reykjavik. The Runner’s Festival is an annual event in the Ísafjörður area, offering a half-marathon and 10 km street run, trail run (10 km, 24 km and 45 km) plus open water swimming and mountain biking. The trail run goes along a rough trail on the peninsula between the fjords Arnarfjörður and Dýrafjörður. The scenery is breathtaking. The Four Forest Run is held in Fnjóskadalur which is 34 km from Akureyri in north Iceland. The race offers four distances making it perfect for the whole family to participate. The course is through four forests in Fnjóskadalur and is extremely beautiful. The Thorvaldsdalur Valley Terrain Run is a 25 km trail run through the Thorvaldsdalur valley in Eyjafjörður, not far from Akureyri. The course is unmarked and participants are free to choose their own path through the valley. The Dettifoss Trail Run in north Iceland is maybe the most beautiful and scenic trail race in Iceland. The race takes you along the canyon of the glacier river Jökulsá á Fjöllum and its waterfalls. There are three distances, all of which end in the stunning Ásbyrgi canyon. The longest distance is quite varied; the surface of the first part is sand, rock and rough gravel before the surface switched to a soil path. The last leg of the route is on sheep paths through a birch forest. A bit further from Reykjavik than most, the Barðsnes off road run is an adventure race in the east of Iceland. The race is held in and around the town of Neskaupsstaður which is located in East Iceland, 710km from Reykjavik. The race starts at the Barðsnes farm and the route takes you through three fjords and finishes in the Neskaupstaður town. Runners take a ferry from Neskaupstaður over to the cape of Bardsnes, where the race begins. The start of the race is near a farm 10 minutes drive outside the village of Borgarfjörður eystri in the north-east of Iceland. The first 6km are uphill on an old gravel road but then the course goes below the mountain ridge of the mountain Dyrfjöll. Halfway through the race you will reach the amazing Stórurð (Big Rocks), a natural wonder that isn’t very well known even among Icelanders. The last few kilometres of the race are down a grassy slope from where the very welcome sight of the Borgarfjörður village comes into view. The total elevation gain is 1087m. The beauty of the trail is unreal, alpine lakes scattered among huge rock formations just below some of the most spectacular mountains in the country. The trail is not always clear and the terrain often difficult to run in, but the scenery is so breathtakingly beautiful that it hardly mattered. We are visiting iceland the week of July 18-24. Looking for a race or run to do. Any help is appreciated. There is another race that weekend , the Dyrfjoll Race, but that is sold out. We are visiting from the 27th of June to the 10th of July. Are there any races during that time period? There are four good races in that time period, it depends on what you are looking for, the Armann race is a 10K in Reykjavik, Snæfellsnes is about 3 hours from Reykjavik, a popular mixed road/trail race. Thorvalsdalur is near Akureyri, the Trail to 101 race is new and we don’t have full details yet. Nous sommes en Islande du 06 au 19 juillet et avons l’impression que 2 évènements de courses sont dans nos dates ! : Komaso race et runners festival westfjiords. Comment s’inscrire ? et ou voir le détail du parcours. The Komaso Eco Trail Race race has not yet a website, so we don’t have a lot of info but there is an advertisement from them on our front page with some details. Looking for Icelandic race options – road or trail between dates of 27-March-2018 and 04-April-2018. Thank you for recommendations. The schedule for 2018 is not fully confirmed yet, but we expect there to be a 5km race in Hafnarfjörður on 29.march, there might also be a 10k in Selfoss (50km from Reykjavik) during that weekend. We will know more later! What a great site! Thanks for all the information. I saw in your calendar that there is a puffin trail race on the Westman Islands. Can you direct me to more information? I am doing the ring road over 12 days. Any suggestions for runs between 30 and 50k that might be relatively snow free in late April/early May? Thanks so much! It is the first time the race will be held and all the details like the start time etc are not fully decided. We are in contact with the organizer and will update the site with more details when we have them. Don’t hesitate to ask again or send us a message nearer to the race. In the highlands there will be too much snow, so Heiðmörk and other trails near Reykjavik would be your best bet.